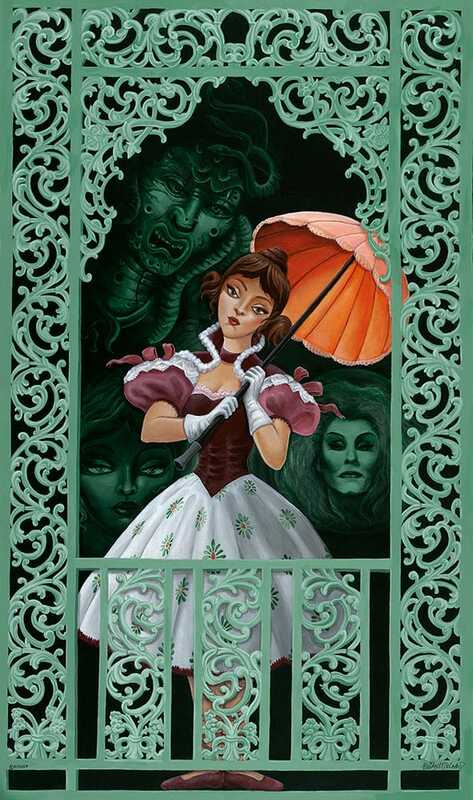 I know the excitement is building as fellow Disney Parks Blog author Steven Miller continues to share the latest news on Haunted Mansion merchandise materializing in Disney Parks. 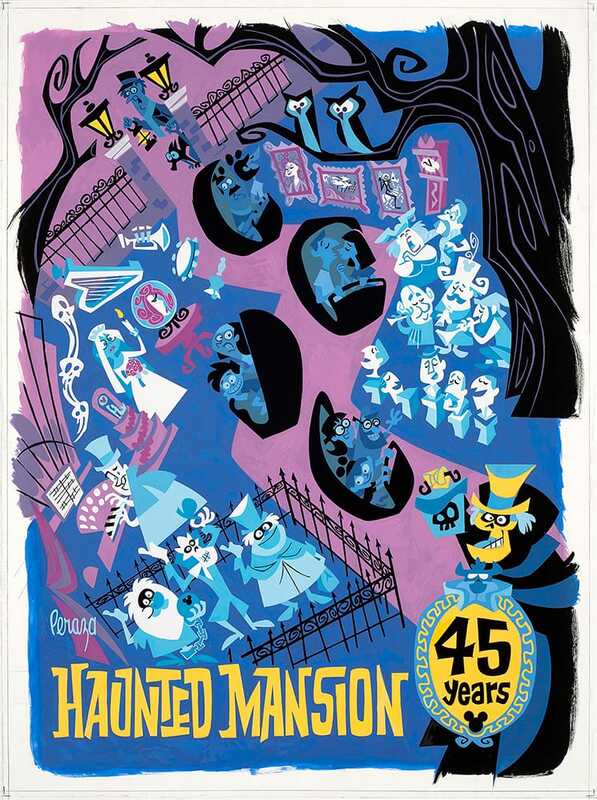 I can hardly believe that in just a few short weeks, we will be celebrating the 45th anniversary of the Haunted Mansion attraction, one of the crown jewels of Disneyland park. 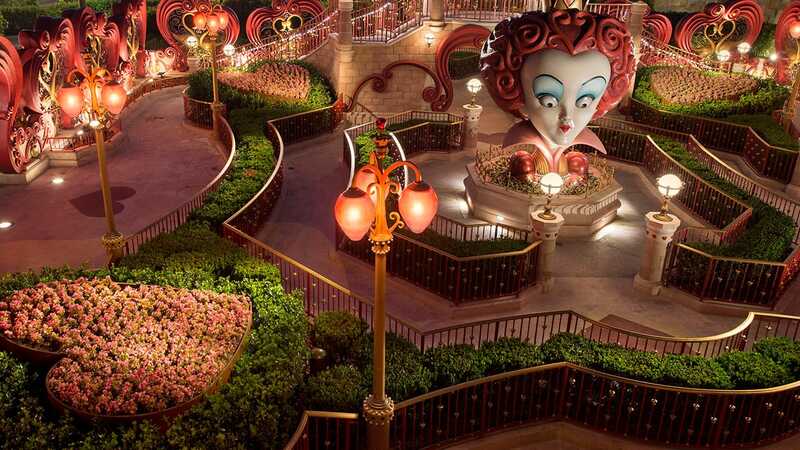 There is so much history behind the attraction itself, its famous and infamous residents, and the storytellers and artists that brought it to life. Here’s your first look at some of the original and limited edition pieces of art, sculptures, figurines and more that will materialize August 16 at Disneyana on Main Street, U.S.A. at Disneyland park. Special Tip: Meet some of the artists behind these amazing new pieces, August 16 from 9 a.m. – 12 p.m. Scheduled to appear are artists: Steve Adams, Dave Avanzino, David Bird, Britni Brault, Brian Crosby, Jeremy Fulton, Brian Kesinger, Daniel Killen, Bridget McCarty, Miss Mindy, Mike Peraza, Javier Soto and Yakovetic. For a complete list of artists who have contributed to this 45th Anniversary collection visit DisneyParksMerchandise.com. 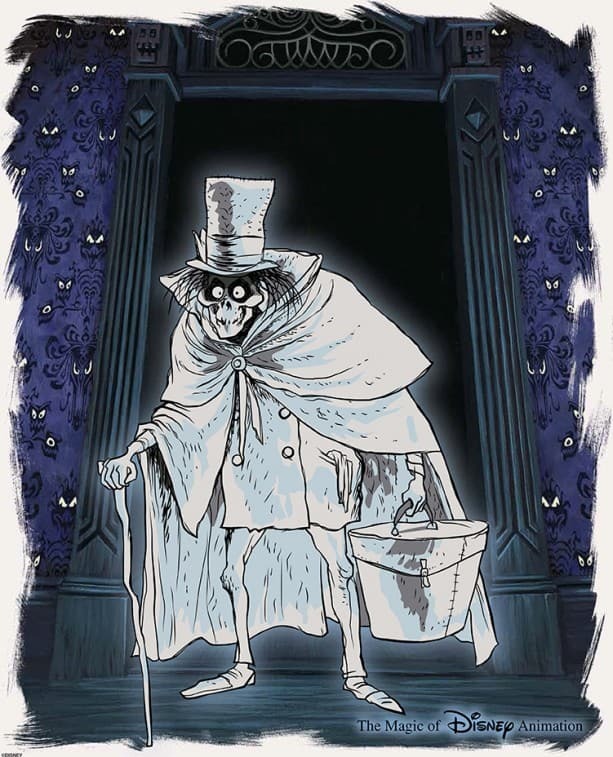 Also debuting as part of the event from our talented team of Ink & Paint artists is the next in the series from our hand-painted cel collection, featuring none other than the Hatbox Ghost. This piece is an edition size of 300 and will be available framed only. Tip: You will surely go ‘batty’ for the framing on this particular piece. Continue to watch DisneyParksMerchandise.com as we release more information on this piece. 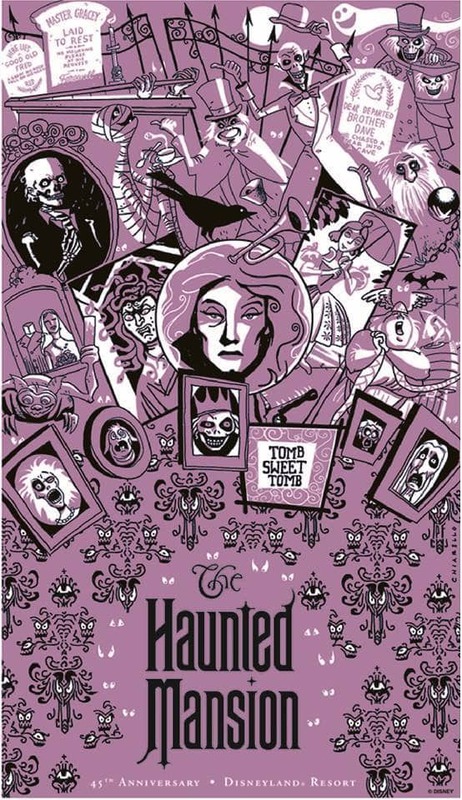 What else do the spirited inhabitants of Disney Theme Park Merchandise and the Haunted Mansion have in store for you? You’ll see. Have you decided which pieces you’re simply dying for? I am trying very hard to find the picture of the tightrope walker with Medusa and Madame Leota in the background. Can anyone help me locate where I could purchase a print? Please tell me when and where I can purchase the new Haunted Mansion Dooney & Bourke handbags! I’ve searched the internet high and low and cant find anything!! When will the new Haunted Mansion Dooney & Bourke handbags be available? AND WHERE CAN I GET ONE? Thank you so much! My daughter and I absolutely love the Haunted Mansion, and we have just recently started our collection. I was very interested in some of the items that I saw will be available at the 45th Anniversary on Aug. 16th, but we live in Louisiana. My sister lives in Los Angeles and is an annual passholder and she was sweet enough to offer to go to the park on that day to try to purchase some of the items that I am interested in. But this would be her first time attending a Haunted Mansion anniversary, so I was curious, is admission into the park the same as any other day? I wanted to be sure she doesn’t have to worry about that day being blacked out on her annual pass. Also I was wondering is there an additional cost to attend the anniversary event? As of right now, none of the pieces featured here or on our the event page of DisneyParksMerchandise.com will be sold online. However, I would recommend reaching out to our Disney Merchandise Guest Services team to inquire about remaining merchandise the Monday after the event. You will find that most of the limited edition giclees do have an edition size, while the deluxe prints do not. I was curious whether the four Stretching Portraits with our favorite characters are individually 39.95 or a set of 4 for 39.95. The Darren Wilson images featuring the stretching portraits will be sold as a set in a limited edition giclee and deluxe print. I can’t wait to meet ALL of the artists! I’m very excited to be a part of celebrating one of my favorite attractions- the original Haunted Mansion in it’s 65th year! I decided to try to pay homage to as much of the attraction as I could squeeze into one frame. The piece was a hoot to do as I knew most of the key designers/imagineers like Marc, Claude, Ken, Harper and Yale and other wonderful fellows who created it back in the day. I did want to include one of my favorite phantoms, the Hatbox Ghost! It’s an honor to be allowed to join in this celebration of such a great attraction and be with so many wonderful young artists. Hi Mike! We’re so very excited for this piece and so many of the other artists who will also be joining us for the event! The countdown begins. Will the Mike Peraza print that is shown at the top of this article be available online? My family and I are from the Bay Area and won’t be visiting Disneyland until December. It looks like a great piece of art that we would love to add to our collection. Also, is it a poster or a print? Hi Derek! As of right now there are no plans to carry the piece online, but that’s not to say it may not occur in the future. The piece will be available in a couple of different formats include a limited edition giclee and deluxe print. What I would recommend is contacting our Disney Merchandise Guest Services team the Monday following the event to inquire about the availability of the items. I think that first picture should be made into an iPhone wallpaper 🙂 These are all wonderful pieces. Love the Donald one. Will they be available at the Magic Kingdom as well? Heading there in a few weeks and I have my Haunted Mansion merch budget in high gear. Hi Jim! Initially you will find these pieces only available at the Disneyland Resort. However I would expect that you may find a few appear at Walt Disney World in the months ahead. Thanks for sharing all this wonderful artwork, Michelle! It is ALL so beautiful! I’m so excited for the Anniversary and all of what Disney has in store or us HM Fans during this next year! This is just the beginning……. Nothing by SHAG for the 45th??? Hi Jonathan! We recently had SHAG here with us at WonderGround Gallery for a different release, which celebrated many of attractions from Disneyland park. 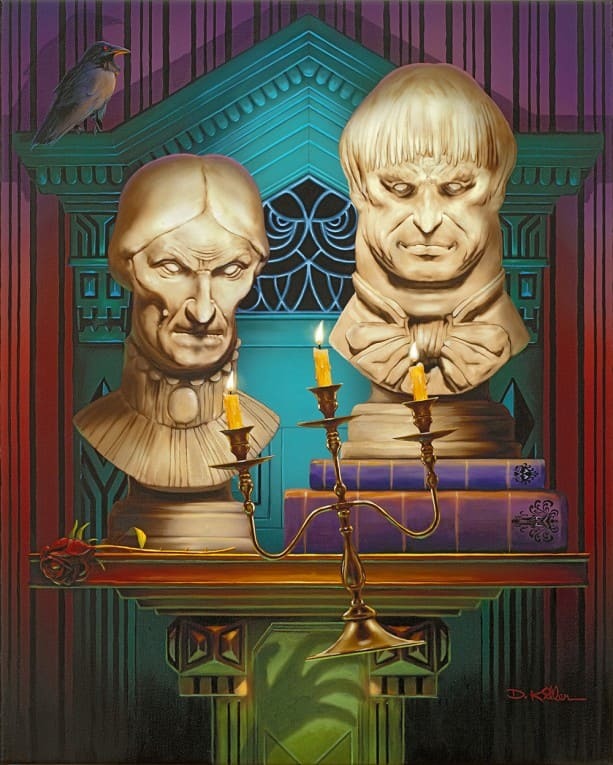 But there will not be a SHAG piece for the specific Haunted Mansion 45th Anniversary release. Will there be posters for annual passholders? Hey Mallory! There are no specific Annual Passholder items in the current assortment, however your Annual Passholder discount will apply on select items. 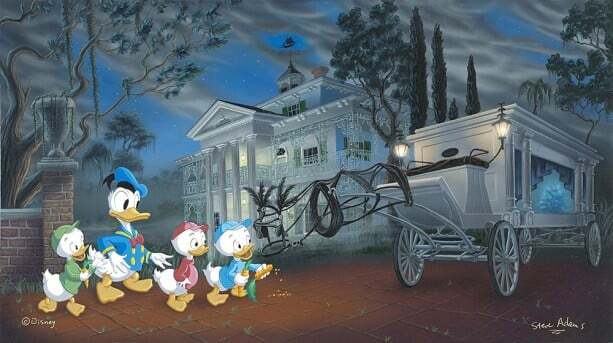 This upcoming 45th anniversary celebration of the Haunted Mansion at Disneyland Park proves to be quite the event and I am greatly looking forward to seeing all the festivities! I just love the art and photos that you shared in your post today, thank you so much! I look forward to sharing this exciting news with all my friends. Thanks Jackie! We’re pretty excited for it as well.